Whether the editors planned it or not, the two stories on page A13 of yesterday's NYT create a poignant juxtaposition. The Bumiller story on top sets up the Bush vacation (Meanwhile, Back at the Ranch, Redefining 'Vacation' - link). 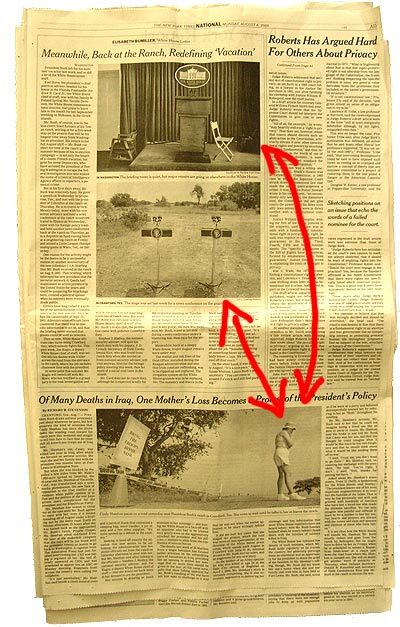 The story below (Of the Many Deaths in Iraq, One Mother's Loss Becomes a Problem for the President - link) gives an account of Cindy Sheehan, the anti-war mom who has set up shop outside the Bush ranch, and is insisting on discuss her son's death with President Bush. As much as the President is bending over backward to emphasize it's a working holiday, he clearly has returned to his pre-9/11 vacation schedule -- if not his pre-war attention span. In the meantime, the slow news period and the focus on Crawford has helped draw attention to Mrs. Sheehan, who would probably have been disappeared under a provision of the Patriot Act if her son Casey hadn't been killed in Baghdad last April. If the "two microphones" photo (set up for a joint press conference between Bush and Colombian President Uribe) is something of a cheap shot, it's seems to also touch a chord. This shot, and the image of Mrs. Sheehan below, reflect the barren desolation that exists in the place of true presidential leadership. This sense is sharpened by the absence of growth (as well as the proximity of cactus to the left microphone) in the top shot, and the presence of orange safety cones in the absence of traffic in the bottom image. In the bottom shot, I also had a reaction to the camera's proximity to the ground. The Administration's shifting story lines about the war; the media's arbitrary and contradictory reporting of it; and the limited geographic distribution of the people involved in it -- makes the entire situation seem almost entirely abstract. In contrast, the view of Mrs. Sheehan at pavement level makes it possible, at least for a moment, to consider the war on a more tangible footing. It suggests it might even be possible to identify paths we could take that would actually lead us from here to there. Isn’t the phrase, and therefore the burden, “if she can be believed” better placed on this White House and specifically, this man, G.W.Bush? Can HE be belived! Ah, I think that's been answered. Wow. It seems the times is giving bush a really rough time with these two. This injured woman... nobody at home... it's pretty powerful stuff. I wonder how these images will play to conservative eyes... All I can say is "very true"
Both views give feeling of desolateness. For Mrs. Sheehan it is "desperately seeking" to meet Shrub. And there is nothing that can make Shrub to see here. How long will the press follow Mrs. Sheehan? War in Iraq goes on...Hopelessness is the feeling. Concerning the Cindy Sheehan picture, can you say 'grass roots'? Wonderful shots. This whole episode of Cindy going to Crawford is so powerful. She is speaking for a whole population who's been beaten up so badly by this monsterous administration. They are ignoring ALL of us, but can't ignore this ONE woman, who has the moral weight and clarity to confront the Beast -- at his own doorstep!! The bottom photo, considered from the "left"/"right" angle is amazing. The sign on the left - Bring the troops home Now - with Cindy having walked to the far right to confront, and TOWER OVER a tiny, distant bush. Amazing. Maybe there'll be a little relief when Dr. Ice comes by next week? ...i only wish we had a virtual "white board", a shareable, visual Wikipedia-like facility here to deconstruct its many aspects as a group exercise: it is that good; powerful ~ simply superb. The pic? Caution! Soccer Mom! Beware of the soccer mom. She'll fight to win. I watched her speak at a congressional hearing a few months ago. I BELIEVE HER. She's been on message for months. Never wavering, never faltering, repeating the same story again and again. Bush treated her disrespectfully. He called her "Mom." He didn't know her son's name. He acted as if he were at a party. When she told him he had no idea of how she was suffering, he agreed with her. Doesn't this sound like the Dubya we all know and loathe? Looks like she's getting company this week. Military families are joining her in Crawford. It's about time. "On Saturday, National Security Advisor Steven Hadley and Deputy White House Chief of Staff Joe Hagin met her outside the ranch, listening to mothers’ concerns for about 45 minutes. Sheehan says she was disappointed. "First of all, I didn't know who they were," she remarks. "They came out and introduced themselves and we talked, and I guess I was supposed to be very impressed and very intimidated." "I told them, I don't want to be lied to, I want to meet with the president—that's an oxymoron—and I thanked them for coming out," she adds. "At one point they said that George believes there are weapons of mass destruction," she continues, "and they said something else to me, and I said, I may be a grieving mother but I'm not stupid. I don't believe you even believe what you’re saying." She's not impressed or intimidated by these suit monkeys nor should she be. They think she's gonna swallow the old WMD line? What an insult! So, do they think she's really stupid or are they really that paranoid? 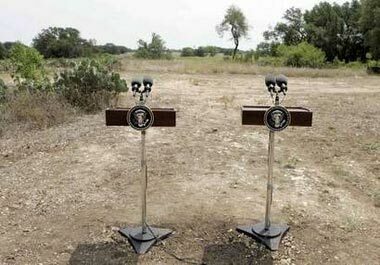 At first glance I thought the two microphones were makeshift gravestones somewhere in a nameless desert. The ranch photos, with their conspicuous absence of people, look like George said, "Heck, I'm hot. Let's go to the fishin' hole." At first glance i thought the two microphones were robotic-like, alien beings that, having landed at the desolate Grover's Mill, were saying: take me to your leader ! nice post and sharp commentary. i'm going to save this one. Wow. Pictures tell it all. Very good - you nailed it! And I agree with bob crane poster; "damn depressing" is right! Cindy's vigilence is serving notice to BushCo that their pathetic attempts to ignore her will only show them up for the heartless bastards they are. With all of the much ballyhooed PR prowess supposedly employed by this cabal of chickenhawk/chickenshit cowards, you'd think someone might mention the effect on his plummeting (dis)approval ratings of publically snubbing the mother of a war hero. Honestly, these clowns get more despicable on an hourly basis. The Times, like so many in the MSM are finally getting off their collective asses and going after the hard issues, after their complicity in cheerleading for the war. Whether it's too little to late to affect a change in public attitude remains to be seen; it's definetly too late for Cindy Sheehan. So much emptiness... and Bush is off somewhere "clearing brush" just to make more of it. I thought, too, of gravestones. And then, scrolling back up to them: what if we gave a war, and nobody came. Being a plant person, I see the prickly pear cactus and know that the ground has been disturbed and that the cactus grows in waste areas. Coincidentally, after reading this post, I was reading the archives of another blog - back in May - and learned (yes I'm backward, you probably all know this already) that Mothers Day started as an antiwar protest. Original Mother's day proclamation, Julia Ward Howe, 1870. ...Then Hallmark appropriated it and made it into the chocolate-box-fest it is today. Maybe next mothers day I'll make some MD cards with Cindy on them.